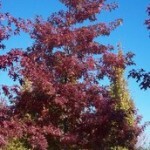 An open, broadly oval tree with glossy, dark green leaves. 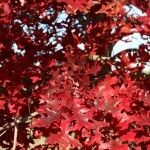 The foliage turns a brilliant red in the late fall. The bark is dark gray to brown and irregularly fissured. It prefers average to dry soils, and full sun. The acorns provide food for wildlife. Useful in parks and similar large open spaces.